Blast Caffeine is pharmaceutical-grade caffeine powder with no fillers, sugar, water, useless herbs or vitamins, artificial colors or flavoring, or dangerous chemicals. This is the same quality used by hospitals and doctors for treating premature babies suffering from an inability to breathe. You will not find Red Bull in a hospital syringe. The container is smaller than a business card and weighs less than an ounce. The flip-top lid has been engineered to safely dispense approximately 100 mg per shake, the same as a cup of coffee. You control how much caffeine to use at one time by adjusting how you shake the container. Use 50 mg or 100 mg or keep your energy constant by shaking 20 mg every two hours. Blast has been designed to hold as much caffeine as 125 energy drinks and fits in the watch pocket of your jeans, in your shirt pocket, or in the waistband of your running shorts. Users have sent photos showing Blast in their socks and in the folds of a ski hat. Marines keep Blast tucked in their jacket pockets on patrol. Caffeinated food or drinks take 15 minutes to begin to feel the energy and 30 minutes to obtain the full effect. 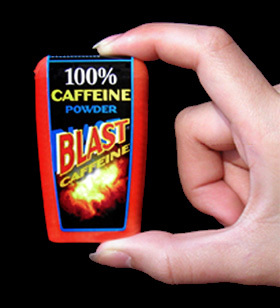 For immediate energy, Blast Caffeine begins to take effect in less than 10 seconds if you shake it directly into your mouth! This is useful for running a 10K, skiing, or trying to finish your taxes. Instant energy prevents drowsy driving, a condition that contributes to over 70,000 injuries and 5,000 deaths a year. One quick shake and you are wide-awake almost immediately. Keep one in your pocket for yourself and one in your car for your family. Blast Caffeine breaks the chains that tie you to coffee, tea, or energy drinks. Blast can energize anything you can put in your mouth. If it fits, Blast can energize it. You cannot find a more convenient, safer, greener, less expensive source of energy than Blast Caffeine. Try some and you will never be without it. Xoxide Zach says - You know Xoxide Zach is CRAZY about Caffeine! How Crazy Is Zach about Caffeine?!?!? I'm so crazy about caffeine that I haven't slept since June 3rd, 1997. This stuff is going to give me another 20 Years of all day, all night gaming.